Bookkeeping entry is automatically created for every financial transaction made in Hyper. 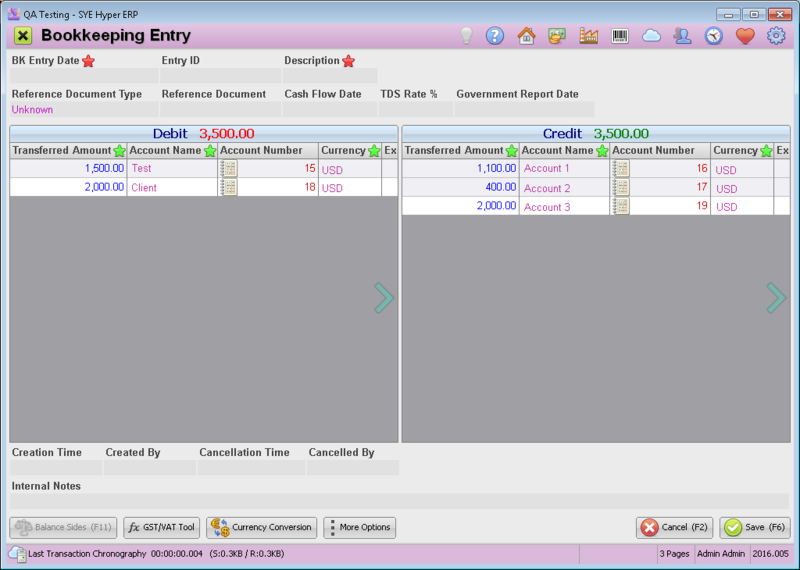 The system also allows to manually create bookkeeping entries. Hyper uses the Double-entry bookkeeping method, and therefore every entry created in an account, requires a corresponding and opposite entry to a different account. Click the New Entry into Running Accounts (F8) button, in the Bookkeeping Entries tab of the Bookkeeping Module. Unknown Create a general bookkeeping entry. Tax Invoice Hyper automatically creates a bookkeeping entry for every produced Tax Invoice. Yet, if the organization produces an external tax invoice, it should be manually updated in the system along with the reference number of the produced document. Receipt Hyper automatically creates a bookkeeping entry for every produced Receipt. Yet, if the organization produces an external receipt, it should be manually updated in the system along with the reference number of the produced document. Also, the TDS % should be defined (if exists). Credit Invoice Hyper automatically creates a bookkeeping entry for every produced Credit Invoice. Refund Hyper automatically creates a bookkeeping entry for every Refund document. Importation Log This reference document type applies to import of goods from foreign country. Supplier Invoice Feed in supplier invoice. This tool is available in the Supplier Card and in the Toolbox of the Bookkeeping Module. Payment to Supplier Report a payment for supplier. The "feed in payments" option is available from the Supplier card as well as from the Toolbox of the Bookkeeping Module. Employees Salary Hyper was not designed to manage salaries. Yet, it allows to import an Excel file from any salary system to create a bookkeeping entry. Since the bookkeeping entry is done in a different system, the transactions to the employees should be manually updated. The new bookkeeping entry should be created via this wizard. The exact Hyper's employee account number should be written in the salaries system, in order to import the salaries details appropriately. Balance Sheet This bookkeeping entry is created at the end of the year, it closes the balance of the account and move it to the new year's balance. This option is available from the "Reports & Lists" tab. The bookkeeping entry is automatically created after getting the CPA's confirmation. Exportation Log This reference document type applies to export of goods to foreign country. Dividend Select this reference document type for reporting a given dividend. Government Report Date - Select the report date, for the tax authorities. This date can be modified from the Account Journal. In the debit side, fill in the transferred debit amount of the organization and the required account name. Fill in the "Private Description" field with a short description of the entry. In the credit side, fill in the transferred credit amount of the organization and the required account name. Fill in the "Private Description" field with a short description of the entry. Choose the required currency. The current exchange rate will be automatically updated and can be manually modified. Please note - These fields can not be modified after creating the entries bundling for this bookkeeping entries. Additional rows can be added by pressing Ctrl+Enter or using the right click menu. Use the button (in the Account Number field) at any time, to open the Account Journal. When both credit and debit sides are equal, the bookkeeping entry can be saved, by pressing the save (F6) button. After saving the new bookkeeping entry, use the Account Journal (F10) button (from the Bookkeeping Entries tab), to bundle the bookkeeping entries. The entries bundle purpose is to match the transferred credit and debit amounts for creating the bookkeeping balance. Balance Sides (F11) This action button is available while creating a new bookkeeping entry and filling in a Transferred Amount in one of the entry's sides. This action button allows to select an Account Name for the opposite entry and automatically fills in the Transferred Amount field in order to make the balance of the two sides. Delete This button cancels the bookkeeping entry. The bookkeeping entry will not be deleted, but will be marked as Canceled. Replace (Fix) This Entry Since bookkeeping entry can not be deleted, this action button will cancel this bookkeeping entry and will create a new one with identical data that can be modified by the user. After saving this entry, it will be recorded and saved as new bookkeeping entry (new bookkeeping entry number). New Entry like this one (F8) This button creates a new identical bookkeeping entry. The system will ask the user whether to keep the transferred amount data. Choose "YES" to copy the transferred amount values. Else, the system will copy only the rest of the data fields into the new entry. Print (F9) Print the bookkeeping entry. This button also allows to save the entry as PDF file. GST/VAT Tool (F5) This button opens a window where the user can split the transferred amount between two accounts: Client/Supplier account and the GST/VAT account. This actions is used for relating the VAT/GST of the entry to the required VAT account. Currency Conversion This action button is available while creating a new bookkeeping entry. This wizard is used for creating a new bookkeeping entry of a currency conversion. After defining the required currencies and exchange rate, the system creates a bookkeeping entry for this currency exchange in the defined currencies exchange inner account. Scanner / Virtual Printing - If any original document (e.g Tax Invoice), this action button is used for scanning the document into the bookkeeping entry. Import Exchange Rates according to BK Entry Date - Update the values of the bookkeeping entry, according to the currencies of the bookkeeping entry creation time. Changes Log - This option is a shortcut to the changes log of the selected Bookkeeping Entry, and displays a modifications log window. Import Data from Clipboard - Import data into bookkeeping entry, as described below. The system allows to create a bookkeeping entry according to imported data from Excel file. By using this button, the user can "paste" a list of accounts and entries of debit / credit, from Excel file. This tool is also used for updating the salary entries that were made by other system. In order to import the data, create an Excel file, with identical "Account Number" index (as defined in the Inner Accounts lists of the Bookkeeping Module). Pay Attention to the Debit and Credit columns. The values of the Credit and Debit columns are imported into the Credit / Debit sides of the bookkeeping entry. Fill in the Credit / Debit values and leave the other side empty. Please Note - all of the bookkeeping entries rows should be imported from a single file. The values of each row can be modified and additional values can be added. 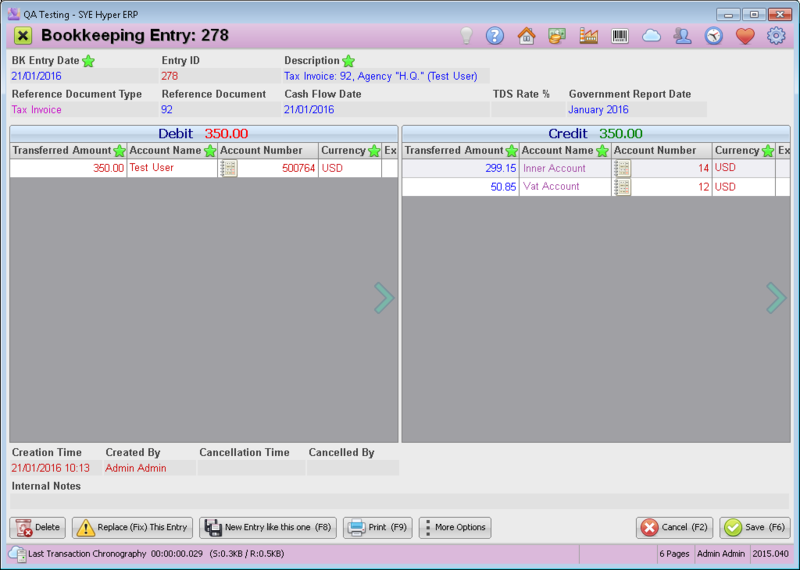 Press the Save(F6) button to create the new bookkeeping entry. After creating the bookkeeping entry, fill in the fields at the top of the Bookkeeping Entry window, including the "BK Entry Date", "Description" and Reference Document Type. Press the Save (F6) button to approve and create the new bookkeeping entry. The income accounts of the organization should be defined in the Bookkeeping tab of the System Fundamentals. Produce a receipt for a bank transfer. This receipt creates a bookkeeping entry from the client card to the defined bank transfer account. In this account, the imported bank statement of the bank transfer and the receipt should be bundled. If there is no defined bank transfer account, the bank statement of the bank transfer should be imported and bundle it with the Account Journal.